You’ll discover how your website can truly build relationships, get clients and make money. Ali Brown and Lisa Manyon share over 40 years of combined Internet marketing and copywriting experience to help you create web copy or revamp your current copy to really connect with your ideal clients. This is the perfect tool to help you reassess your copy (it’s recommended you do this quarterly) and rewrite it as needed. Why copy is “Queen” and content strategy is “King”–no matter what you’ve heard in the past, we reveal the truth about copy and strategy that really works to promote web sales. Recommended resources from Ali Brown and Lisa Manyon and a coupon code for $100.00 off a Manyon Marketing Web Makeover (this process helps uncover hidden revenue streams and gives you one-to-one access to dial in your web strategy and messaging with Lisa). Order the digital download for instant access to improve your web copy and strategy. 1. Always asking people to take an additional step – a call to action. To look at this as an ‘invitation’ rather than a sale and to use such unobtrusive languaging such as “While you are here would you like to take a look at my book?” I am implementing this on all my ‘thank you’ pages! 2. Connecting my copy with my ideal client. It has taken me nearly two years to nail down my Ideal Client! I ‘found her’ just before this course was offered and now I will be changing my copy to read as if I were speaking directly to her. Llisten to this FREE audio to assess where your website copy and strategy might need help… (hint: it’s possible that you have unrealistic web expectations and need a different strategy). 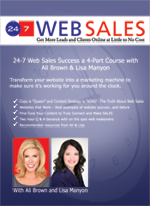 In this information-packed, one-hour session, Ali Brown and Lisa Manyon team up to offer nearly 40 years of combined marketing insight to dramatically improve your web content and strategy. This audio and worksheet will give you and overview of the program details and help you get clear on your web strategy and content (two things that will never go out of style regardless of technology advances). Listen to the audio and download your worksheet to get a sneak peek into what you’ll learn when you invest in the 24-7 Web Sales Secrets course.